1793 the HMS Discovery sailed into Hawaii under the command of Captain George Vancouver. Great Britain was determined to extend its influence to the Hawaiian Islands. They decided the way to do this was to give the islander’s cattle. These were not happy cattle; they had spent a long time in cramped quarters enduring a sea going voyage they must have found horrific. Captain Vancouver’s first attempt at landing 10 Longhorn’s did not succeed, the poor cattle were practically starved, they died. His second try succeeded and the cattle took to heart encouragement to multiply. Admonished by the Brits not to harm the cattle, they got on with the business of procreation and by 1830 the island of Hawaii had approximately 20,000 cattle laying waste to the environment and threatening the populace (remember these were Longhorns, not the most docile of cattle). Something had to be done, the answer was cowboys. The Parker Ranch in Hawaii is famous, in Aloha Cowboy you learn its roots. Cowboy culture had a few challenges the mainland cowboys might avoid, like lava flows. It was a dangerous life, for the men and the cattle. Meanwhile back on the mainland by 1898 Cheyenne Wyoming had fallen on hard times. The population had dropped from 10,000 to about 1,500 hardy souls. Something had to be done to rejuvenate the town and bring in some tourist to keep the merchants and hotels in business. Thus was born Cheyenne Frontier Days and the beginnings of rodeo. Buffalo Bill Cody’s Wild West Show provided the opening act. It was a grand success. By 1908 Cheyenne’s Frontier Days rodeo was internationally famous, the premier rodeo of its age. Three Hawaiian cowboys were entered; Ikua Purdy, Jack Low, and Archie Ka’au. At first the Wyoming crowd assumed their boys would have an easy win, but the Hawaiians were game, it was soon clear this was going to be a real competition. Want to know who won? Read this fascinating, colorful, book full of history and grand characters from the past! In August 1908, three unknown riders arrived in Cheyenne, Wyoming, their hats adorned with wildflowers, to compete in the world’s greatest rodeo. Steer-roping virtuoso Ikua Purdy and his cousins Jack Low and Archie Ka’au’a had travelled 4,200 miles from Hawaii, of all places, to test themselves against the toughest riders in the West. Dismissed by whites, who considered themselves the only true cowboys, the native Hawaiians would astonish the country, returning home champions—and American legends. An unforgettable human drama set against the rough-knuckled frontier, David Wolman and Julian Smith’s Aloha Rodeo unspools the fascinating and little-known true story of the Hawaiian cowboys, or paniolo, whose 1908 adventure upended the conventional history of the American West. What few understood when the three paniolo rode into Cheyenne is that the Hawaiians were no underdogs. They were the product of a deeply engrained cattle culture that was twice as old as that of the Great Plains, for Hawaiians had been chasing cattle over the islands’ rugged volcanic slopes and through thick tropical forests since the late 1700s. The hopes of all Hawaii rode on the three riders’ shoulders during those dusty days in August 1908. The U.S. had forcibly annexed the islands just a decade earlier. The young Hawaiians brought the pride of a people struggling to preserve their cultural identity and anxious about their future under the rule of overlords an ocean away. In Cheyenne, they didn’t just astound the locals; they also overturned simplistic thinking about cattle country, the binary narrative of “cowboys versus Indians,” and the very concept of the Wild West. 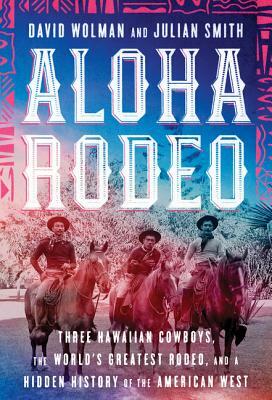 Blending sport and history, while exploring questions of identity, imperialism, and race, Aloha Rodeo spotlights an overlooked and riveting chapter in the saga of the American West. DAVID WOLMAN is a Contributing Editor at Outside. He has written for the Wired, the New York Times, New Yorker, Nature, and many other publications, and his work has been anthologized in the Best American Science and Nature Writing series. He is the author of The End of Money, Righting the Mother Tongue, and A Left-Hand Turn Around the World. David lives in Portland, Oregon, with his family. JULIAN SMITH received a Banff Mountain Book Award and a Lowell Thomas Travel Journalism Award for Crossing the Heart of Africa: An Odyssey of Love and Adventure. The coauthor of Smokejumper: A Memoir by One of America's Most Select Airborne Firefighters, he has written for Smithsonian, National Geographic Traveler, Wired, Outside, and the Washington Post, among other publications. Julian lives in Portland, Oregon.